CONDITIONS OF SALE: This painting has to be exhibited at least 80 days a year at the National Museum of Contemporary Art in Seoul free of charge. It must never leave the country, even for a temporary exhibition. STORY: In 2010 South Korea had the highest suicide rate among the 30 OECD countries, having just surpassed Japan&apos;s rate. With more than 29,000 suicides in 2009/2010, Korea loses about 80 people every day! 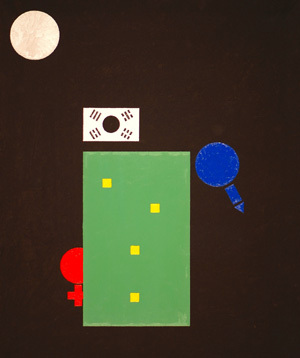 South Korean flag on top of the green rectangle is turned upside down, and the red and blue yinyang is missing from the central circle. The latter was used to colour male and female biological symbols. The male (blue) symbol is positioned is such a way that it looks like it is jumping from a building head-first, and four yellow squares on the green rectangle are an unlucky omen (the Korean word for "four" sounds identical to the word for "death"). The female (red) symbol is partly hidden behind the green rectangle, symbolizing the fact that in traditional Korean society women have long been in a disadvantaged position, and especially referring to the woman&apos;s use of softer tone in order to minimize conflict or aggression. The black background and the silver circle provide an atmosphere of night and desperation. Note that four yellow squares (windows) are arranged in a question-mark pattern, representing our lack of knowledge on how to deal with the social phenomenon of suicide. The price is an approximate number of living South Koreans.